There are a few things to note for this week. My specific necktie searching finally paid off a bit. 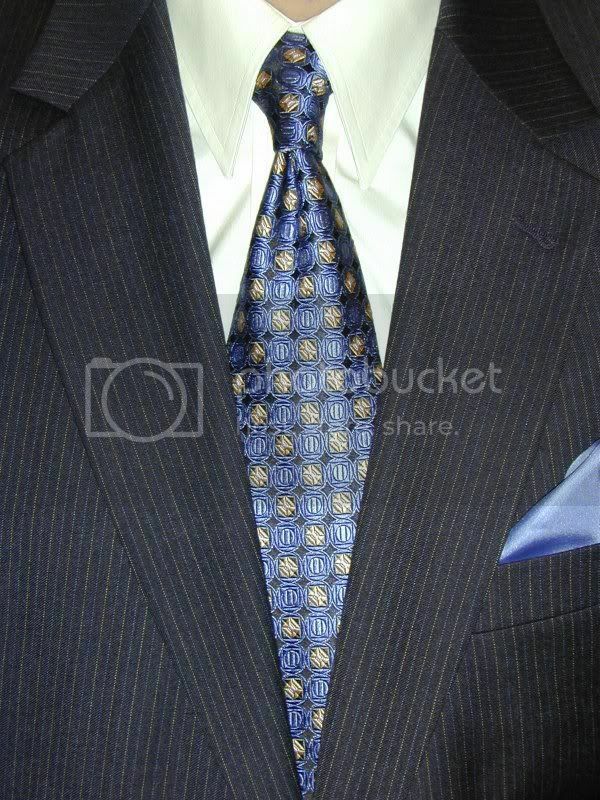 The bottom picture in this conglomeration of conglomerations is the first tie I was looking for -- something different to pair up with my charcoal pinstripe suit. I visited with a salesman at a local menswear shop -- the only non chain in the area -- and he helped me select this tie based on my description of the suit. I think he nailed it pretty well, sight unseen, and even suggested the dress shirt color too. 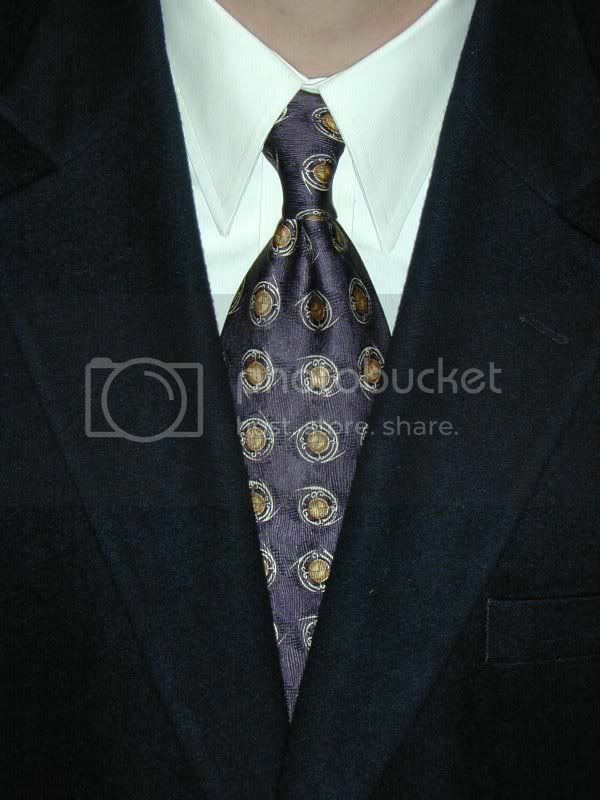 It's a JZ Richards necktie and cost as much as about 10 Ebay ties! I have not ever spent that much on a tie before. Yes, I did have buyer's remorse but when I conglomerated it all together, it subsided. A little. The interesting thing about JZ Richards is that the ties are manufactured very near me in Boulder, Colorado. Boulder is known as "The People's Republic of Boulder" and "Eastern California" thanks to their fairly liberal views in an otherwise fairly conservative state. One would be more likely to see tie dye rather than a necktie. Maybe next time I visit I should sport a tie dyed necktie! Personally, I really like the town as a nice place to visit but I wouldn't want to live there -- it's too expensive because they've really clamped down on growth. If I had the money, though, I would live there. Boulder is nestled up against the foothills of Front Range of the Rockies and next to the Flatirons. Gorgeous! The bike trails are extensive and have very nice scenery to entertain. The Pearl Street Mall is full of street performers at any given time, has several very cool bookstores, one of the best toy stores I've ever visited, a kite store, and the best burritos in the area. I couldn't find specific pictures of some of those places but this link has a general overview of Boulder that's fairly good. 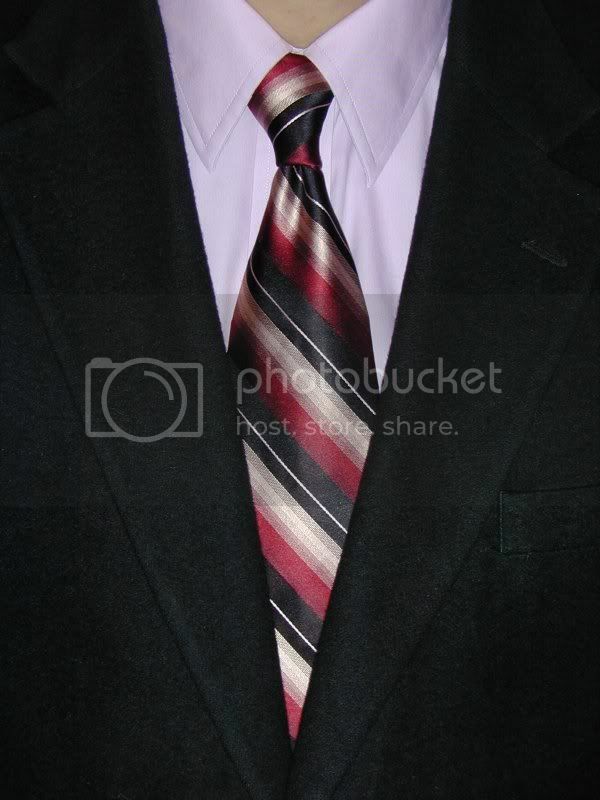 The next conglomeration up from that is also the next necktie for which I was searching. 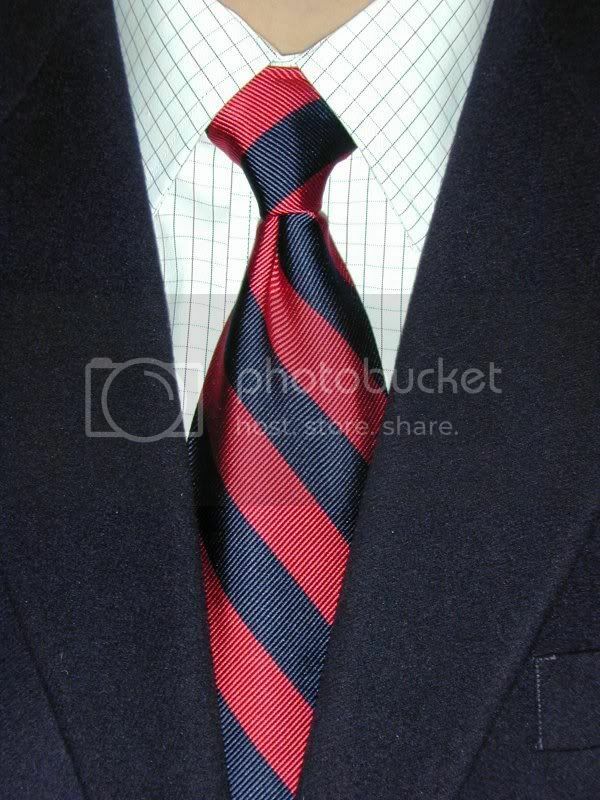 Yes, a simple navy, red "regimental stripe". I liked the blue, navy, white stripe tie on my blue and navy windowpane dress shirt so well that I thought a navy and red would look as good on the navy and red windowpane. I don't like it as much so I may try and find a navy, red, white stripe. It shouldn't be too difficult to find. 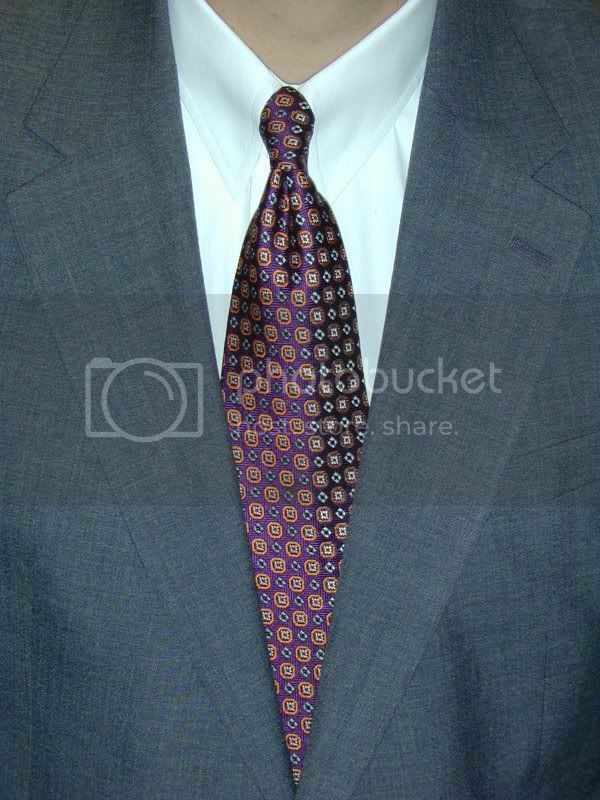 The third up from the bottom is the also another specific search necktie. I had been trying to find another tie to conglomerate with the "orchid" Lands End dress shirt. It ended up being more difficult than I thought it would. And again, I ended up with another striped tie. I was really trying to avoid a stripe. I did get many compliments on the conglomeration so it must not be too terribly bad. The remaining three ties are really nothing special. The first, going from bottom to top, is another Ferrell Reed City of London. 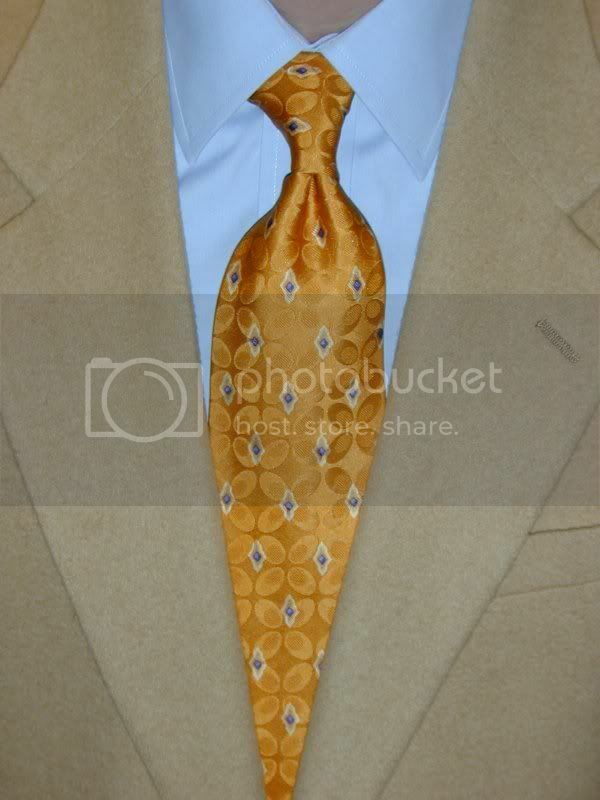 It's actually a favorite of mine and one that I can put on anytime on mornings I don't feel like deciding on neckwear. The next up is another Jos A Bank Signature. It's a fairly difficult tie to conglomerate so it's saved for mornings when I've planned to wear it the night before. Last, but not least, a black and gold Robert Talbott Studio. This is actually my funeral tie. Seems to be anyway. No, it was not a funeral tie that day, thank goodness. Personally I think funerals should be colorful and celebratory.